Legally Strawberry Blonde: Lets get Organized! I know, ANOTHER POST?! Well I'm sick and rather not unpack all my clothes and what not from break so I'll do a post about how I organize my makeup! If you know me, you know I'm a touch OCD and VERY particular about where everything goes. 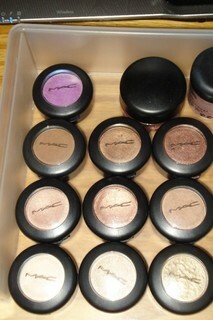 My makeup is, of course, no exception! So I thought I'd show you my setup at the dorm! Its small but organized! An overview of my perfumes, body sprays and brush and basics holders! 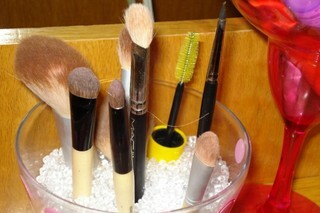 Brush holders are great for staying organized and for keeping your brushes safe! And can even be a margarita glass! This obviously isn't made for brushes! I actually just got it as a gift but its a plastic margarita glass! Which can be found at party stores! But anyways I like this to keep my basics in so I'm not searching everywhere! 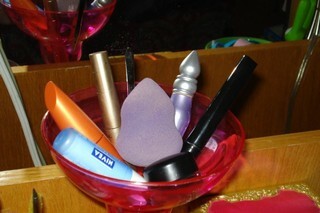 Basics like tweezers, lip conditioner, eyeliner, mascara, eye shadow primer and sponge! Basically the stuff I use every day! And its cute! 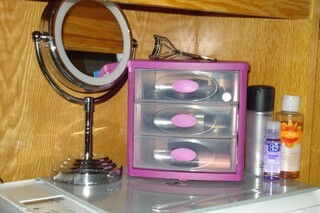 I got this little storage container from Target for under $5, I think it was $3! But I LOVE it! Mirror is also from Target, it lights up! Gosh, I love Target! Face drawer! 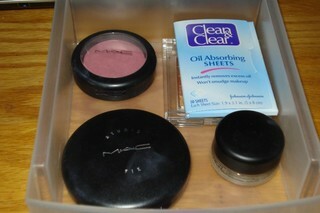 I'm always losing my oil blotting sheets! Yes, that is ALL my face products! I know sad! Lip drawer! 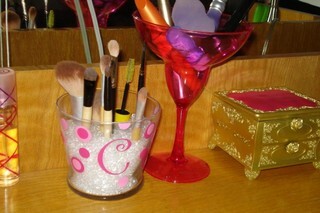 Lipglasses are organized lightest-darkest, same as lipsticks and dazzleglasses! I hope this helped you get organized and gave you some ideas! 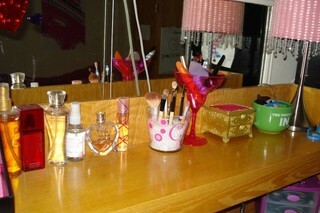 How do you organize your makeup?! Really cute collection! Mine is even smaller when it comes to eyeshadows. Could you maybe do a blog on a mac starter kit if you havent already? I just stumbled across your blog and haven't read anything yet. 208 vs. 209 EYELINER BRUSH DEATHMATCH! E & L & N OTD!